Latin is the language of a vast quantity of untouched source material. Despite the widespread popular interest in research into local and family history there has been no recent text book to help the beginner to cope with the great barrier preventing access to that wealth of information. . . medieval Latin. This book remedies that omission. It embodies the author's experience as a university teacher of Latin examination in the local history certificate courses which he organised. 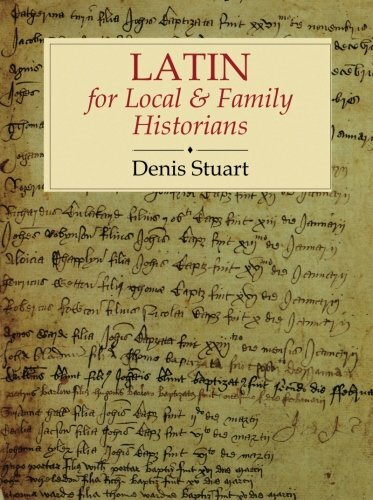 After dealing with the basic grammar of Latin, this very practical book examines the structure and vocabulary of the records used in local and family research, including episcopal visitations, church court records, sepulchral inscriptions, wills, manorial court rolls, charters and deeds. A final chapter explains the abbreviations used in medieval Latin. The book is complete in itself and contains all the necessary tables of declensions and conjugations plus a glossary of more than eight hundred words and is uniquely 'user-friendly'. The tempo of instruction is slow; the passages for translation are carefully graded for grammar and vocabulary and selected both for their intrinsic interest and for their representative character. The author believes that, although Latin cannot be made simple, it is nevertheless manageable. The reader who works systematically through the book will be equipped to handle the Latin of the documents encountered by the do-it-yourself local or family historian. Following the enormous success of his earlier Manorial Records (1992), the author has now furnished the research with another invaluable guide to fill an even more fundamental gap in the 'how-to-do-it' library. All previous, partial attempts to deal with the problems of medieval Latin sources are totally eclipsed by this welcome primer - both comprehensive and easy to use. If you have any questions about this product by Brand: The History Press, contact us by completing and submitting the form below. If you are looking for a specif part number, please include it with your message.